Louise Phillips Writer: The Barking Crow! 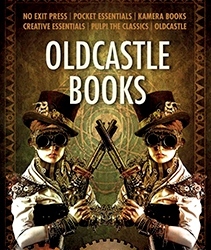 Devised as part of the celebrations for 30 years of Oldcastle Books, the competition was open to any unpublished writer with a passion for crime fiction. The intention was to find original voices that epitomise the No Exit Press List: strong, compelling writing that resonates long after the final page. The judging panel, headed by Oldcastle Books MD Ion Mills, includes bestselling author of the Geraldine Steel and Ian Peterson series, Leigh Russell; A is for Authors literary agent, Annette Crossland and one of Britain's finest noir critics, Barry Forshaw, author of Nordic Noir and Euro Noir. The shortlist will be announced on September 1st and the winner, who will have the opportunity to meet with Barry Forshaw, Leigh Russell and Annette Crossland, with the possibility of being signed by No Exit Press, will be announced on November 1st.